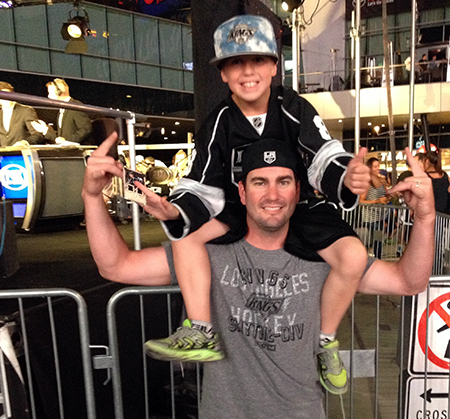 Upper Deck’s Random Acts of Kindness Campaign Hits the Staples Center! I’ve had the chance to take in Stanley Cup Playoff games a handful of times before in my life, and needless to say it’s usually a different animal than anything you’ll experience at a regular season game. The intensity on the ice is significantly elevated and that is reflected in the energy of the fans in the seats. For Game 6 of the Pacific Division Final between the Los Angeles Kings and Anaheim Ducks the crowd was crazy! 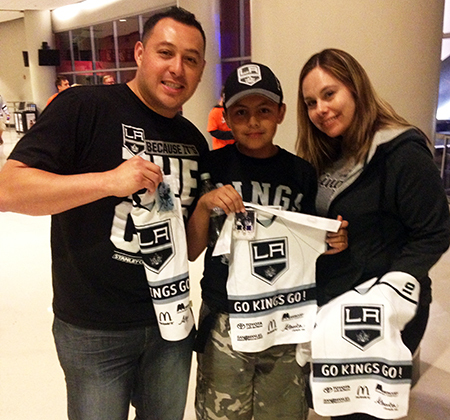 Kings fans in particular were on edge as their team faced elimination. Granted, the Kings had already faced elimination four times in these playoffs, but how many times can a team stare down the barrel without blinking? As it turned out, at least once more. When Trevor Lewis slipped a wrist shot through John Gibson’s pads in the second period to give LA a 2-0 lead, all that tension came pouring out as the sellout crowd all at once seemed to sense a looming Game 7. It wouldn’t be easy by any means, as Kyle Palmieri scored shortly after that to cut the lead to 2-1 and LA had to fight to protect a one-goal lead for the final 24 minutes and change. The last minute and a half or so, after the Ducks pulled goaltender John Gibson for an extra skater, was as intense an ending to a game as I’ve ever seen in person. Anaheim had the puck in the offensive zone nearly that entire time, laying siege to Jonathan Quick and the scrambling LA defense, but couldn’t dent the net to even the score and send the game to overtime. 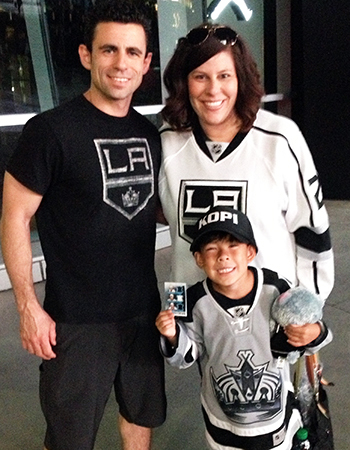 I ventured up to Los Angeles to share the fun of the hobby with die-hard hockey fans! My main reason for being there however was to bring Upper Deck’s Random Acts of Kindness program to fans in attendance! 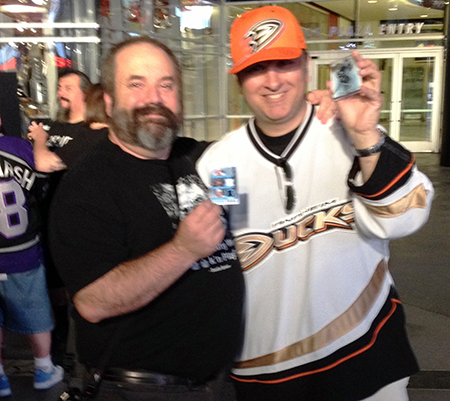 Earlier in game, I walked around the concourses mingling with fans, handing out packs of 2013-14 NHL® SPx and 2013-14 NHL® Fleer Showcase, as well as some choice insert cards of Kings and Ducks players. I did the same when the game finished, chatting with folks in the concourses and then outside the arena near the Kings Live set, where fans were watching Patrick O’Neal and Sean O’Donnell break down the action. It’s always fun to get out and share these exciting cards with passionate hockey fans, whether they’re collectors or not, and it was a special thrill to see kids get excited by some of the cards I gave out of their favorite players. We call it Random Acts of Kindness for a reason, and believe me, we get just as much enjoyment out of these type of encounters as our fans do. 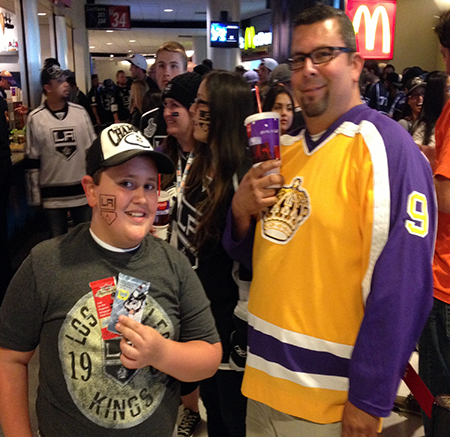 These two were thrilled when I shared a Kings insert card with them! Seeing so many happy kids made this promotion really fun for me! Kids got a huge thrill out of getting some FREE packs and cards from our Random Acts of Kindness promotion! Everyone was loving the free packs at the game! 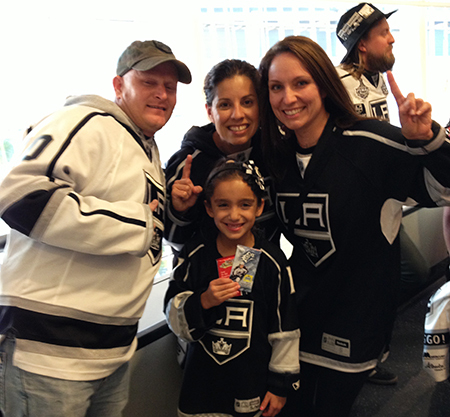 Some fans were almost as happy with a Kings victory as they were with getting free Upper Deck cards! One of the cool and unique aspects of this series, obviously, is the close proximity of the two teams and their fans. The Honda Center in Anaheim and Staples Center in downtown Los Angeles are separated by a mere 30-mile stretch of the I-5 freeway in Southern California. But in their 20 years of coexistence, the two teams have only qualified for the Stanley Cup Playoffs in the same season three times, all in the last four years. And while both have won the Stanley Cup recently with the core group of players that make up this year’s rosters, they had never met in a playoff series before. I went with some friends to Game 1 in Anaheim and my rough estimate is that visiting Kings fans made up about 35 percent of the crowd. When LA scored, it was loud; and when Marian Gaborik scored with 7 seconds left to tie it, then scored again for the game-winner in overtime, the Honda Center was up for grabs. It was a very different scene at Staples Center for Game 6, with only about 10 percent of the crowd clad in the orange and black of the visiting team, which from my understanding is not unusual when the teams play in LA. It’s almost too bad this series had to end, though it’s certainly fitting that it went the full seven games. It’s been a season like no other for the three NHL teams in the Golden State, and in particular Southern California. It can’t help but give the game a boost in this part of the country, which in my opinion is great for the game as a whole, whether you’re American, Canadian or a fan anywhere else, expanding the talent pool is an undeniably good thing. 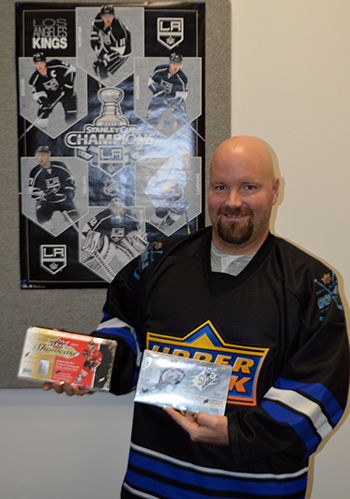 How many new hockey fans and players have been created this season won’t be known for many years, but we wanted to do our best to help by sharing the fun of Upper Deck NHL® collectibles with those in attendance! Very cool! Wish you guys would come to S. FL and do some things. LOL oh wait, the Panthers stink…..
awesome, keep doing great things UpperDeck!